Subject to correction, the product was first added on 2019-01-14 16:14:38 and the last date we have for this product is 2019-01-14 16:14:38, where the last unit was sold for R 903, which may have been a final clearance price. Canon BP-2L14 Battery Pack - 1450mAh, ZR100, ZR200, ZR300, Optura, Elura Copyright © 2019 ComXpert International CC - COPYING IS ONLY ALLOWED FOR THE PURPOSE OF SENDING US ENQUIRIES. E&OE. Small and lightweight, Lithium batteries can be charged or discharged at anytime without developing memory effect. This means they never lose their ability to hold a full charge. Dimensions (WxHxD) 1-3/4 x 1-1/4 x 1-1/8"
The best price and guaranteed service and backup from official computer suppliers in South Africa for the 9582A002AA Canon BP-2L14 Battery Pack - 1450mAh. Find related 9582A002AA Canon BP-2L14 Battery Pack - 1450mAh products in our Digital camera accessories Category for even more options. 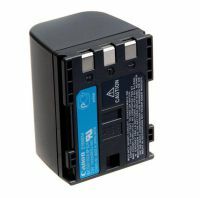 Read reviews and find out about 9582A002AA Canon BP-2L14 Battery Pack - 1450mAh. Discounts, specials and cheap prices only at ComX Computers.